Emergency 24 / 7 / 365 Available! With over 30 years experience and real focus on customer satisfaction, you can rely on us for your next sweeping, vacuuming, CCTV Inspection or wash down! Interested in any of our services? Use our form to get more information and pricing! AAA Sweeping was formed in 1985 as a commercial parking lot sweeping and snow plowing company. We have expanded steadily and now operate the largest privately owned fleet of snow plows, sanders, mechanical sweepers, vacuum trucks and water trucks in the Inland Northwest. 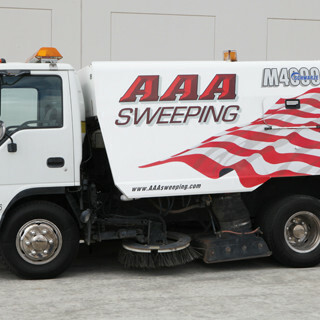 AAA Sweeping also offers Industrial Vacuum Trucks/ Jet Rodders and Video Inspection services. of specialty equipment operators dedicated to providing quality results and customer satisfaction on every job. SERVING WASHINGTON, OREGON, IDAHO AND MONTANA! "We are very pleased with the quality, convenience, and price. We have several more repairs budgeted for next year. I can personally recommend AAA Sweeping for this innovative sewer line repair procedure." AAA Sweeping was formed in 1985 as a commercial parking lot sweeping and snowplowing company. We have expanded steadily and now operate the largest privately owned fleet of snowplows, sanders, mechanical sweepers, vacuum trucks and water trucks in the Inland Northwest.